The Madman's Daughter is a re-telling/alternate view of the H.G. Wells classic The Island of Dr. Moreau told from the point of view of Moreau's daughter, Juliet. Accused of performing inhumane and ungodly experiments, Dr. Moreau abandons Juliet and her mother when she is 10 years old. Believed to be dead, Juliet's life is flipped upside down though when she finds out that he is alive and well off on an island in Australia, possibly continuing the work that made him flee England. With no prospects and poverty imminent in London, Juliet takes the treacherous journey to the island to confront her father and learn the truth about the rumors herself.Guys, I was so impressed with this book. I wasn't sure if I was going to like it, having never read the Island of Dr. Moreau (though I did see that bad Marlon Brando movie in the 90's). I also heard that there was a dreaded love triangle (which we will get to later), which made me a little skeptical. But I was really surprised by how much I liked it. 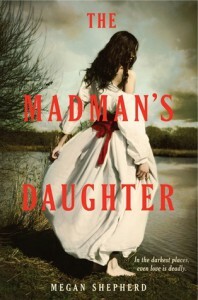 If you like dark, gothic novels and don't mind (or like) a bit of blood, then you will like this book.The Madman's Daughter throws you into the thick of things right from the start, giving you a taste of the grisly experiments that Dr. Moreau has been accused of. If you're squeamish or don't like descriptions of animal cruelty, do not read this. It's definitely not for the faint of heart and the book does not shy away from the dirt and the dark side of life.I thought Juliet was a really great character. She's had to take care of herself from a very young age but she doesn't feel sorry for herself. I understood the anger she felt towards her father but also her naive hope that life will be better once she finds him. She's really smart and isn't afraid to stand up for what she believes in and I really admired her. Dr. Moreau is cold and arrogant and I hated him for how he treated Juliet, Montgomery, and the islanders. His moods were so mercurial, changing from fatherly affection one minute to rage the next. There is also a love triangle in this book. I don't know about you, but I am pretty sick of love triangles. How is it that every girl has two men fighting over her? I digress. Juliet had two very different people vying for her affections in The Madman's Daughter. Montgomery is her childhood friend who knows all her secrets and still loves her. But Montgomery has been living on the island with her father for years and Juliet isn't sure that she can trust him or her feelings towards him. Edward Prince, the handsome survivor of a ship wreck, is Juliet's equal in society and shares her horror of her father's experiments. She's drawn to both men but, for me, Montgomery was a much more compelling character. He's not perfect by any means but I felt like they had much more of a connection with their shared past. Edward was too mysterious and I thought he was a bit bland. While I was rolling my eyes at the love triangle throughout the book, it is somewhat justified in the end.And that ending - wow! What a twist! I knew something big was going to be revealed but I didn't see that coming. What impressed me the most about this book though was that every page was so rich with atmosphere. I really felt like I was in Gothic London and on the mysterious island. Chilling and intense, The Madman's Daughter is fraught with tension and I could not shake the feeling of impending doom while reading it. If you like dark, disturbing stories with rich characters and surprising plot twists, don't hesitate to pick up The Madman's Daughter. I can't wait to read the next book coming out in Jan 2014.